The Kansas State University College of Engineering Hall of Fame will induct two new members on March 28. 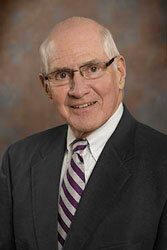 Jim Schroeder, Leavenworth, graduated from Kansas State University in 1963 with a degree in electrical engineering. Upon graduation, he joined Westinghouse Electric Corp. as a development engineer in the large power transformer division, later co-authoring the Great Western Manufacturing Co. Inc. in Leavenworth, the oldest continuous manufacturing company in the city. He retired in 2012, but remains with the company in an advisory position. Under his leadership, Great Western grew from a supplier of sifting equipment for the flour milling and cereal grain industry into one of the country’s leading manufacturers of quality control sifting equipment for the food processing industry. A longtime member of the International Association of Operative Millers, he is the recipient of its Allied Trades Award. In 1996, he was named Alumni Fellow of the College of Engineering and has served on the College of Engineering Advisory Council. Active in community affairs, Schroeder has served on numerous local boards, including the Country Club Bank & Trust Co. and as president of the Cushing Hospital board. Charles “Chuck” Grier, Wichita, graduated from Kansas State University in 1973 with a degree in construction science, and a commission in the U.S. Army Reserve, Corp of Engineers. He began his career with Eby Construction in Wichita, moving on to Utility Contractors Inc., Tulsa, Oklahoma, eventually returning to Wichita to assume increasing executive leadership roles with the company and a subsidiary, Building Systems Corp. In 1991, Grier was named president of Utility Contractors Inc., and in 2007 became the sole stockholder of the growing, progressive company that operates primarily in the water/wastewater treatment and energy markets focused on heavy and industrial construction. Grier is a lifetime national director of the Associated General Contractors of America, has been a presenter of Engineering Extension Seminars for the University of Wisconsin, serves as a director for a local regional bank and has held several leadership positions on community boards, as well as numerous district and council positions with the Boy Scouts of America. He was recently recognized with the Distinguished Eagle Scout Award by the national association.